John Richards, BAAS Member; BACAS Member. John Richards, BAAS Member and BACAS Member led the Summer Walk to Stanton Drew. He started by telling us that the farmer who owns the land around the site, found a cremation urn while laying a new track. It was dated to the Bronze Age 1900BC. In Paul’s field opposite the church and pub, was a Medieval monks’ fishpond and a possible Roman Causeway. Was there a Neolithic settlement there too? John Aubrey investigated the monument in 1664, but the barley was high and he did not see enough of it. However, he did notice that the villagers were breaking up the stones. 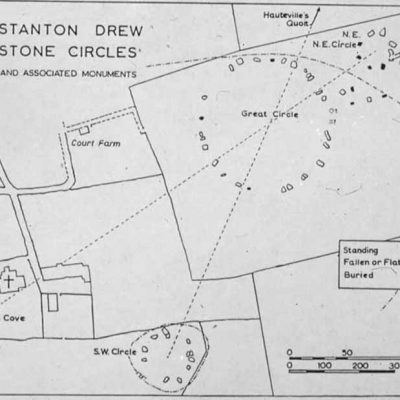 Later William Stukeley visited and he mapped out his solar and lunar planetary circles on to the site – this was indicative of the 18th Century mindset. Stukeley also mentions two ‘quoits’ and that they are found in different places. The second one has not been found today. Hauteville’s Quoit was found in the hedge bordering the site. This was named by John Aubrey and Prof. Tratman investigated it in the 1960s. 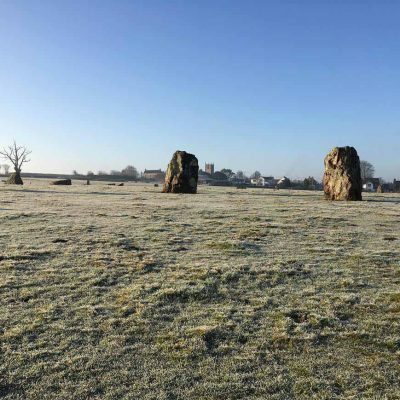 There are three types of stones used in the circles, including limestone and dolomitic conglomerate and are locally sourced. 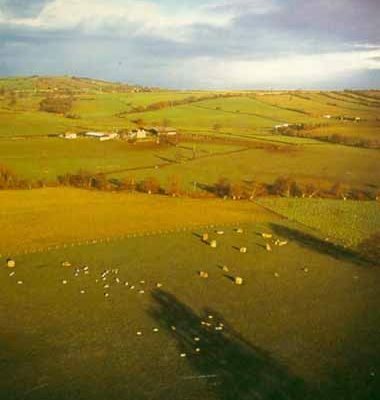 A mound, north of the monument was found to be a natural mound, but is a significant landmark. It is on the edge of the floodplain which was very extensive from the River Chew. In 2014, it lapped the stones. 4m of alluvium was built up, which Jodie Lewis investigated with excavation in the 2000s. Where the Avenue leads to the River Chew, it would have been more of a cliff down to the River in the Neolithic. Jodie Lewis excavated in 2003 close to the farmyard and found a recumbent stone, together with some Medieval pottery (13th Century). It may have been Medieval people who buried the stone. Geophysical surveys have been carried out inside the great circle (by English Heritage) and more recently by BACAS around the Cove and the pub garden. The geophysics around the cove suggests there might have been a long barrow. 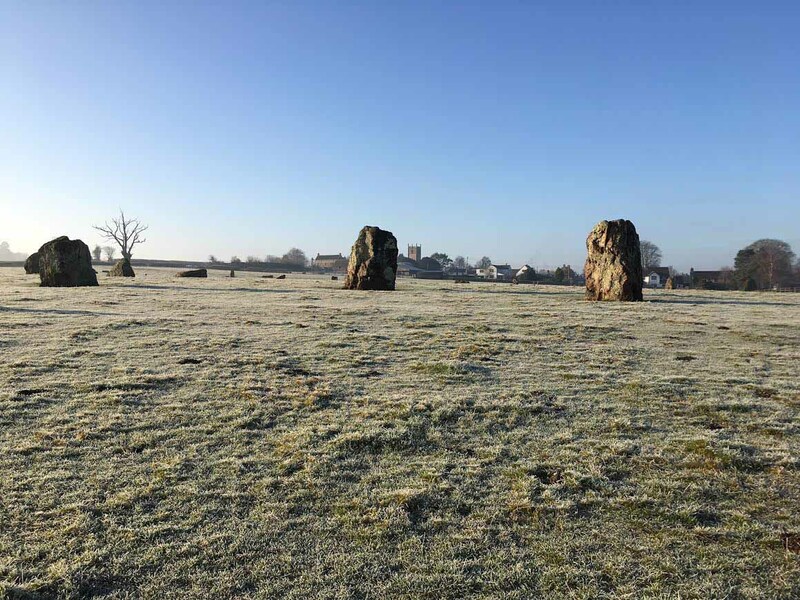 Leslie Grinsell was against the idea of a long barrow here, but George Nash is more positive. 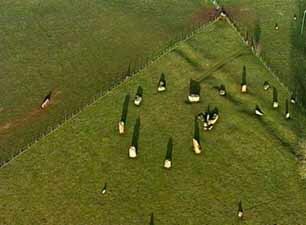 The 1997-8 geophysical survey undertaken by English Heritage revealed nine concentric circles of postholes inside the Great Circle, that would have held large timber posts. The survey also revealed a ditch and bank enclosing the circle. The folklore relating to the monument is that a wedding party was turned to stone by the Devil because of dancing after midnight. We also visited the church of St. Mary the Virgin. Originally built in the 13th Century, but refurbished in later centuries, in particular in 1847. All that remains of its earlier origins is the Norman font. 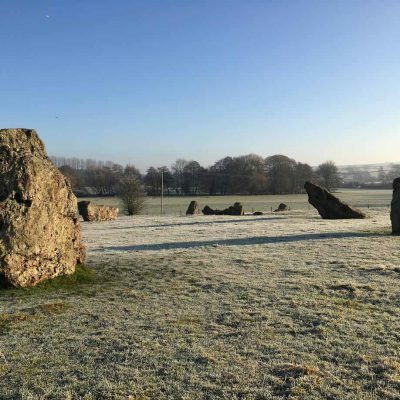 This is an enigmatic and important Neolithic monument that stands within the north east Somerset landscape.